Microsoft today issued the first refresh of Windows 10 to Insider participants since the OS's launch three weeks ago. Windows Insider is the name for Microsoft's ongoing preview program, which kicked off last fall. Rather than close down beta testing with the official release -- as it has with past editions -- Microsoft will continue Insider as an integral part of its new servicing and maintenance model. The build, labeled 10525, was announced Tuesday by Gabriel Aul, engineering general manager for Microsoft's OS group and the regular spokesman on Windows 10's update topics. 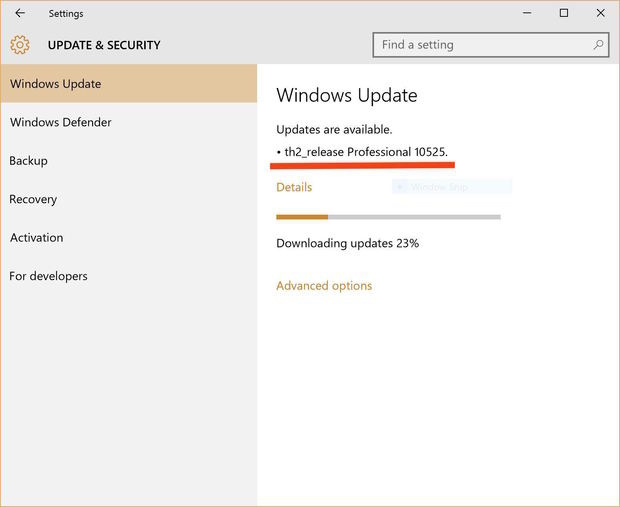 Build 10525 was served to Insiders who had previously opted in to the "fast" subset, called a "ring," of the beta program. Windows 10's launch build was tagged as 10240, which went public July 29 but had been handed to Insiders six days prior. Aul called out just two changes in build 10525: Additional color options for personalizing some of the OS's core user interface (UI) elements, and enhancements to the operating system's memory management, specifically a cache of compressed "pages," or contiguous memory blocks. The pages are stored in virtual memory rather than written to the device's physical storage. The compressed-page caching should result in "better responsiveness across Windows 10," Aul contended in a post to a Microsoft blog, and will free up physical memory -- the actual RAM available on a device -- so that more apps can be maintained in the former for quick recall and resuscitation. The trade-off? "Since the system process holds the [compressed page] store in memory, its working set grows larger exactly when memory is being made available for other processes," Aul wrote. "This is ... the reason the System process appears to be consuming more memory than previous releases." Memory page compression -- and storage in physical memory -- is not new. It has a two-decade history. Nor was Windows the first operating system to rely on it. In 2013, Apple debuted memory pressure-accommodating page compression, the tactic also deployed by Microsoft, with that's year's OS X Mavericks upgrade. Microsoft has made much of Insiders' role in providing feedback to help it determine which features are worthy of adding to the production code, and for those that are, whether they're ready for mainstream adoption. Aul reiterated that today. But program members will also serve as the first external guinea pigs. Only after Microsoft has quashed bugs reported by Insiders and determined that the build meets whatever quality bar it's established, will the Redmond, Wash. company roll out the code to the consumer update track, called "Current Branch." In turn, consumers will function as testers for Microsoft's most important customers -- large organizations -- to theoretically cull even more flaws before they get the update on the corporate-quality Current Branch for Business. Aul also signaled that distribution changes are coming to Insider. "We're also evaluating the Windows Insider rings, and considering whether we should make changes there," he said without delving into details. "We're putting plans together now, so you won't see any changes immediately, but they will come over time." Among the ideas that Aul has floated in the past was a faster-than-fast ring. Microsoft is not expected to begin delivering significant Windows 10 updates to those not registered with Insider until later this year, when it will start using the branches-and-rings model. After a four-week pause, Microsoft today restarted Insider by distributing build 10525 to testers who had opted in to the 'fast' ring.